At Fairfield, we pride ourselves on our knowledge and ability to untangle complex cases. Our reputation in the investment of further education means that we continue to see patients referred from other veterinary surgeons. However, we still find time to support a number of local animal charities in the more routine surgical procedures. The Cats Protection are a nationwide charity with a very committed group in Hinckley. In combination with local volunteers we are engaged in a comprehensive "neutering" campaign for a number of nearby feral cat colonies. Essentially, these "wild" cats are trapped humanely and transported to Fairfield. Once here they have to be handled with a great deal of care, patience and expertise which I am proud to say my nursing team have in abundance. 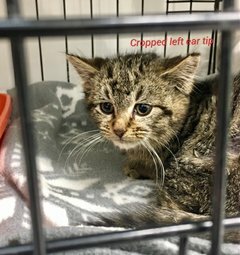 Using specially adapted cages they can be successfully anaesthetised and then either castrated or spayed using the same high tech equipment available for our more complex procedures.